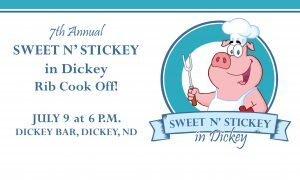 The Seventh Annual Sweet N’ Stickey in Dickey Rib Cook Off will be held at the Dickey Bar on Saturday, July 9, 2016. All proceeds will be given to Hospice of the Red River Valley in memory of loved ones who have passed away, most of which have received Hospice care in the community. “We continue to hold this event because we are so thankful for the care Hospice has and continues to provide to our loved ones, and we look forward to another successful cook off,” Chrissy Kartes, event organizer, said.